I grew up in the largely homogeneous, middle-class suburbs of Ottawa back in the 1980s; a time when it definitely wasn’t cool to be “ethnic”. As a result I had to assimilate as best I could to blend in to the dominant white, anglo culture. This assimilation created a bit of a rift in my family; my parents are first generation immigrants, they speak with an accent and hold on to many old world Chinese values and customs whereas my brother and I were essentially middle-class suburban white kids … if it weren’t for the fact that we looked Chinese. American playwright Lauren Yee explores complex identity issues and sends them up in deliciously irreverent manner in her play Ching Chong Chinaman which fu-GEN Theatre Company is presenting for the first time in Canada. 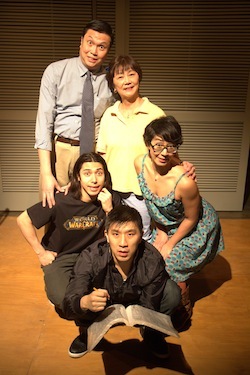 The play centres on the lives of the Wongs, a perfectly assimilated middle-American family. Father Ed (John Ng) is the patriarch, breadwinner and enjoys playing golf on the weekends. Mother Grace (Brenda Kamino) is a bored housewife; an Asian-American June Cleaver. Daughter Desdemona (Zoé Doyle) is an overachieving student grubbing grades to get her early acceptance into Princeton and son Upton (Oliver Koomsatira) is a serious online gamer and is obsessed with World of Warcraft. Upton is determined to make it to the world championship competition for World of Warcraft and aims to spend all his waking hours playing to qualify. To take care of his other duties; school, chores, social, obligations, he hires an indentured servant from China, which he calls J (Richard Lee). Hilarity ensues. At the start I found I spent a great deal of time trying to figure out the tone and direction the show was aiming for. The play is a farce and the characters are over-the-top, stylized caricatures. At its core Ching Chong Chinaman is essentially a show about the American dream. There are references to President Lincoln and concepts like manifest destiny. Yee’s script is prime, evolved satire, it doesn’t rely on the the crutch of pitching the familiar to its niche audience to elicit the “Oh my god, that’s so funny because it’s true” reaction. Sacred cows like Amy Tan’s Joy Luck Club are lovingly skewered but Yee’s script is rarely crude and never goes for the obvious. The farce extends to Camellia Koo’s brilliant set design. The Wongs’ house is an elaborately altered shipping container and all of the show’s props from the family’s furniture and appliances to their iPhones to some of their clothing items come wrapped in their original packaging. Director Nina Lee Aquino paces the show well, gradually building the action to a frenzy. Hats off to the strong ensemble cast for pulling off what turns out to be an incredibly physical production. While I finally got used to the tone of the show after a while and did find parts of it uproariously funny I think that at times the show just goes too big and gets so outlandish that it feels like they’ve lost the plot a bit and has gone from satirical to just plain silly. What struck me most about the play though was how much I wasn’t able to relate to it. Perhaps it’s the fact that the American “melting pot” setting is so far removed from my daily reality in multicultural Toronto or maybe it’s the fact that the satirical aspects of the play render the characters’ experiences so absurd that they really aren’t relatable. Regardless, I actually find it refreshing to see a play by an Asian-American playwright that moves beyond the familiar and explores identity in such an original way. Daniels Spectrum (585 Dundas Street E, Toronto). Tickets are available in person at the Daniels Spectrum box office (1 hour before performance), by phone at 1-800-204-0855, or online. Previous PostCheap Theatre in Toronto for the Week of March 11th, 2013Next PostReview (Kid Plus One): Scooby-Doo Live! Musical Mysteries.